Welcome to those of you joining me from TheCanaDisney Blog and those of you just hopping aboard. I am the 2nd stop on our Magical Blogorail. When we started talking about this month's Magical Blogorail Blue topic - transplanting an attraction from another park into our favorite Disney park, I immediately thought of something I'd heard on a WDW Today Podcast: Bring Horizons to Tomorrowland - next to it's sister attraction, the Carousel of Progress. Apparently, Horizons was the next generation of the Carousel of Progress - and as an attraction I vaguely remember (with fond memories! ), I'd love to see it back in action. I originally heard of this area - located at both Walt Disney Studios Paris and more recently at Hong Kong Disneyland - around the time Disney announced they were bringing Avatar and James Cameron to Animal Kingdom. While I have yet to understand Avatar, Toy Story Playland makes perfect sense. Now that it is DHS and not MGM and no longer a working studio, DHS could use a major pull - it does have 3 E-ticket attractions (Rock 'n Roller Coaster, Tower of Terror, TSMM), but it could use some more in-between attractions. 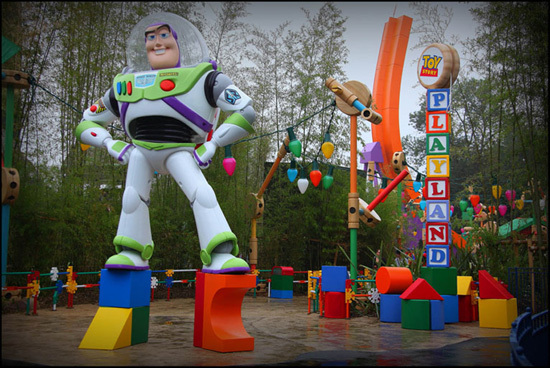 Toy Story Playlands have just that! I believe that Jim Hill said Pixar Place was originally expected to be much larger, but I think that money became an issue - well, as an Imagineer, I would love to point out that Disney profits are up 21% this year already and this would be a great place to start sharing that wealth! I personally would love to see these attractions, but don't expect to visit Hong Kong Disneyland or DLPR in the next.. well honestly, 20 years or ever, so I think they should bring them closer to home! As an Imagineer, this is where I would start! 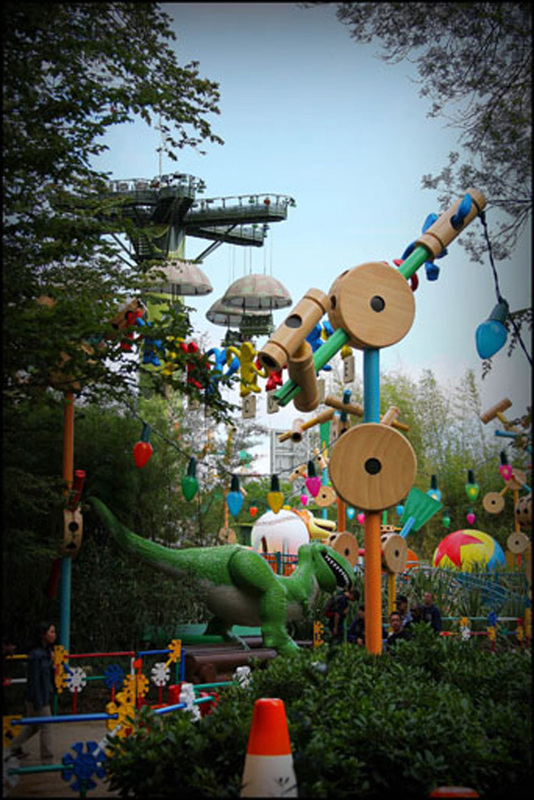 For more pics and description of the Toy Story Playland, check out this post on the Disney Parks Blog from 2010, when it originally opened in Paris! Great idea Jenn!! Like you, I don't really get the Avatar tie in with Disney. I would much rather see something like this. They need to do this ASAP! Honey I Shrunk the Kids hasn't been relevant in over a decade, replace it with Toy Story! I completely agree! I'm jealous that the overseas parks has this great place and we don't have it.